Birdwatching is not the most extreme or dangerous pastime. Apart from a dodgy moment on a 300ft sea cliff on Shetland and a machine gun in the face in the Gambia, I haven't ever felt that it could be the end of me. At most it exposes you to what could best be described as mild peril. One such incident today brought these two words into my head and the resulting train of thought/birdwatching/photography adventure you are about to read. 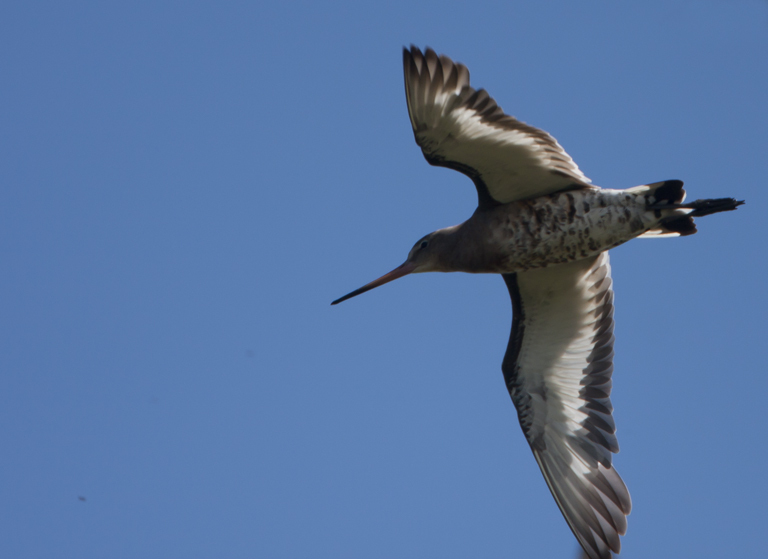 Up to Gilroy to check out some Black-tailed Godwits. Numbers exploded last Friday and today we have reached the giddy heights of 350 birds. Among that number on Saturday was a ringed individual that we have not seen before. 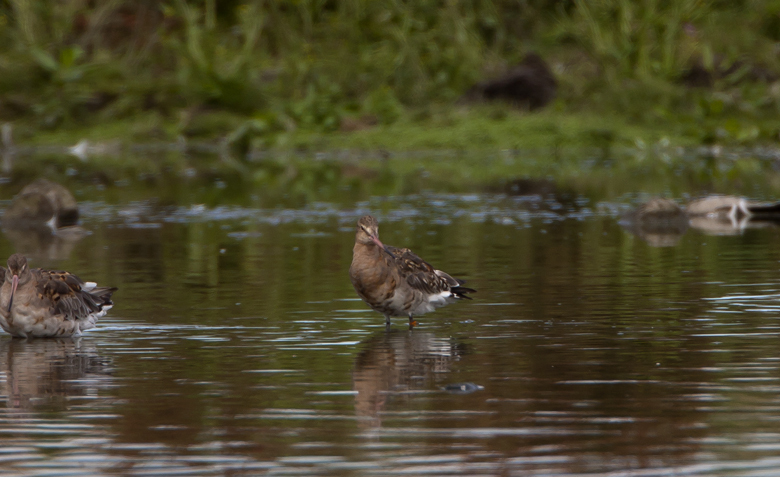 We can send off our sighting to the researchers knowing that each contribution adds a brush mark to the picture of Godwit migration that the scientists are painting. As I adjust my position to get a better view of the flock I decide a small hump in the ground looks like a good vantage point. As I dance through the nettles (the stings are still buzzing on my ankles as I write this several hours later) I notice a wasp. Then another. Then a whole cloud of the things. I have only gonr and wandered into a nest. The hole is about 2 inches in diameter on the top of my proposed lookout. I beat a hasty nad not too dignified retreat to lower, safer ground. I later decide to try and photograph the nest to better illustrate this story but the beasts have other ideas. Sea cliffs and boat trips notwithstanding, I have had enough mild peril for a Monday afternoon. It is too far away for decent pictures so the following are just to illustrate this post, but I spy the top few millimeters of an orange ring. Cool, now I just need it to move into the shallows I'll note the code, pass the info on and our migration picture becomes a little more vivid. After a while the bird still hasn't moved, in fact it has settled right down and not even the top of the ring is visible. I lock the tripod and telescope on it, put the word out that a ringed bird is about (a fellow ring enthusiast is on location in a matter of minutes) and settle in to wait for movement. It is now that it occurs to me that our best chance of seeing it move is if there is a mildly perilous situation for the flock causing it to stir. Nothing extreme, I am not a fan of disturbing birds, but something like a gull barging through the pack or a high pass from a Sparrowhawk. This bird seems unflappable though. 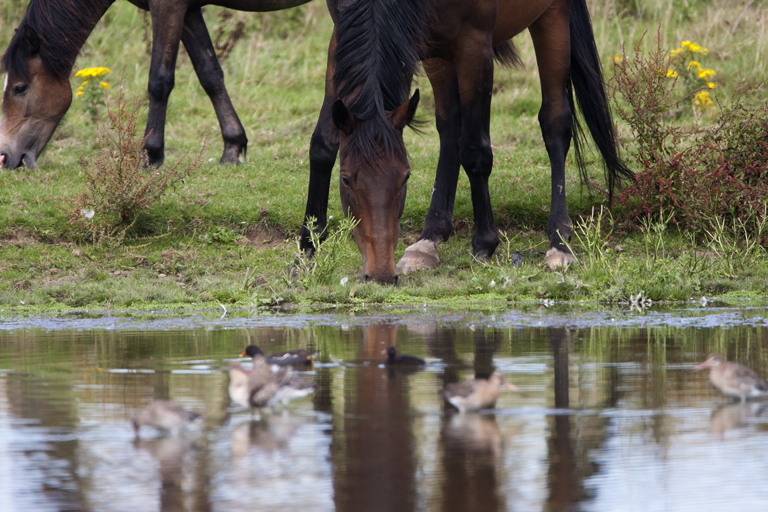 It's near neighbour in the flock has a wash, sprays it with greenish water and it stays asleep. Gulls come and go and still it keeps it's cool. 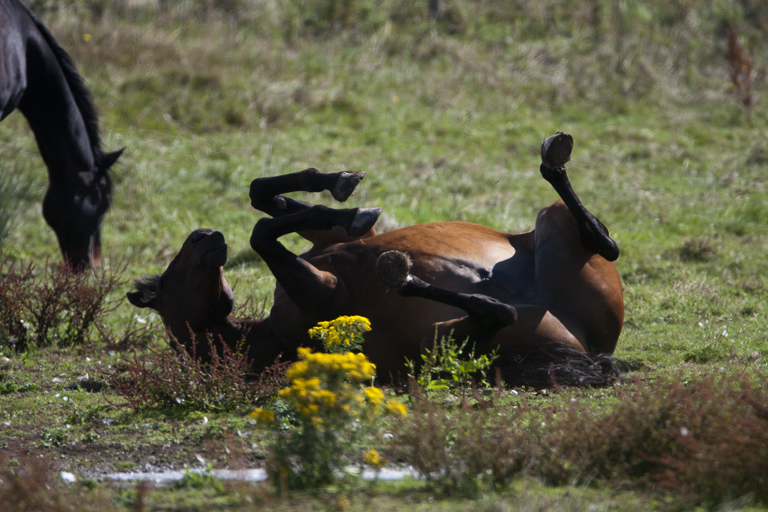 Even the horse that was enjoying the sun earlier cannot rouse it from it's slumber. 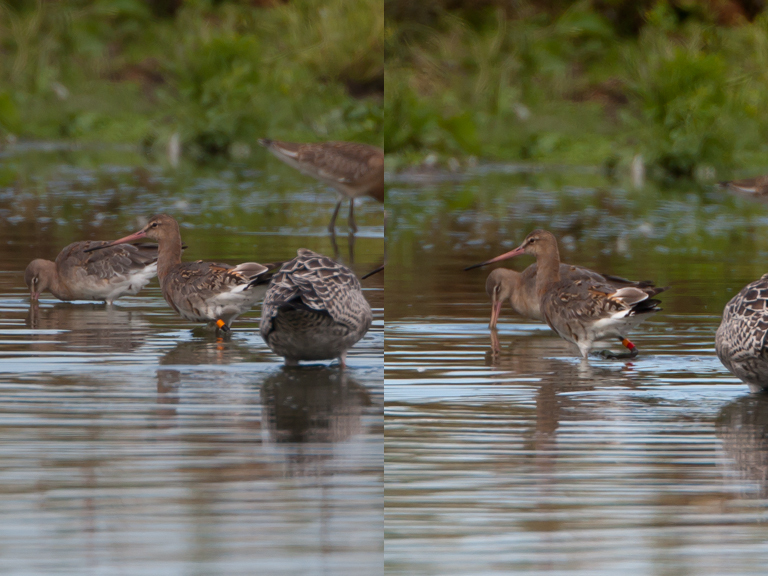 I get the feeling that this Blackwit is far braver than me. 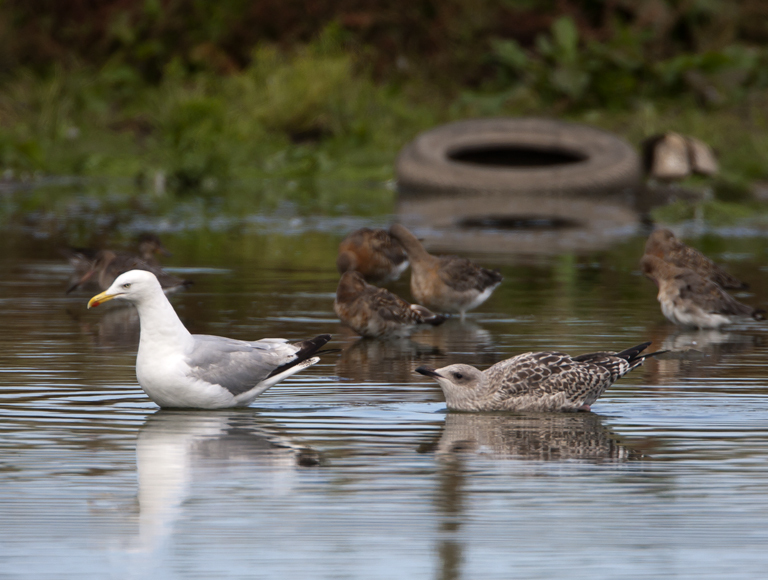 However it is eventually forced from it's spot by a Herring Gull and trots off to the left. I'd had plenty of time to anticpate what would happen so i was ready with a plan, It would be a tall order to get all 4 rings on the bird's legs as it ran from the mild peril presented by the gull. So I decide to trust the camera's motor drive to take enough frames to piece together the code. As it moves off I fire the shutter on a continuous burst for a few seconds. Once the bird has stopped it settles in deep water and the rings are gone from view. A quick review on the screen of the 40D show that I haven't got all 4 rings on one shot, but I have got one of each leg showing the rings. SO by deduction we get the code of ON-OR (orange over black on the left tibia, orange over red on the right). This rings a bell. Out comes the notebook, pages turn. There it is in black ink on yellowing pages. ON-OR seen at Gilroy on the 10th August 2010. Awesome! Nearly a year to the day! This is what is so great about these ringing projects. It shows that migration is not some random primitive instinct. This bird appeared in the same place as last year within a week of last years arrival date. It is 6 years old and has visited Gilroy each year since 2008. I last saw it on 31st August last year.